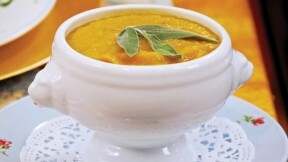 This Best Butternut Bisque is a true showstopper, perfect for any cold-weather meal. Presented here as an elegant first course, you may also serve this versatile potage as a hearty luncheon entree or main dish supper soup. Fit a steamer basket into a large pot with a tight-fitting lid. Add 2 inches of cold water, then add the squash. Cover, bring to a boil, and steam for 7 minutes. Add the cauliflower and onion. Sprinkle with the Italian or all-purpose seasoning and steam for 20 minutes or until the squash and cauliflower are both very soft. Put the squash mixture in a large bowl. Let cool for 15 minutes. Add the apples, cinnamon, ginger, and salt and stir to coat. Put half of the mixture in a blender. Add 1¼ cups vegetable broth and 1 tablespoon maple syrup and process until smooth. Pour into a soup pot. Put the second half of the squash mixture in the blender. Add the remaining 1¼ cups vegetable broth and 1 tablespoon maple syrup, and process until smooth. Add to the soup pot, and then stir the two batches together. If the soup seems too thick, add more vegetable broth to taste. Put the pot over medium-low heat, cover, and simmer, stirring often, until heated through, about 10 minutes. To serve, ladle the soup into bowls. This soup may be made up to 24 hours ahead of time. If making in advance, let the soup cool after blending, then pour the cooled soup into an airtight container and refrigerate (see note). To reheat the soup, pour it into a pot. If soup seems too thick add more vegetable broth, to taste. Cook for about 15 minutes over medium-low heat, stirring often, until heated through.